Hospitals are one of the most important cornerstones of every modern health system. Despite this fact, the total number of hospitals in the United States has been constantly decreasing during the last decades. In 2016, most of U.S. hospitals were non-profit facilities, while the rest was divided in nearly equal parts into for-profit or state/local government hospitals. In the same year, all U.S. hospitals provided approximately 895 thousand beds. The percentage of persons with a hospital stay has been slightly decreasing since 1997. As expected, older people aged 65 and over are the group with the highest percentage of hospitalizations in the United States. The average length of a stay in a community hospital also fell from seven days in 1993 to 5.5 days in 2016. In the meantime, the total number of hospital admissions increased from 33.2 million in 1993 to a record high of 37.5 million in 2008, but dropped to 34.9 million in 2014. Hospital costs make up a large share of total health costs and have more than quadrupled since 1990. More than one third of over three trillion U.S. dollars of total national health expenditures are attributed to hospital care costs. On the other hand, the economic impact of U.S. hospitals should not be underestimated. In 2016 for example, community hospitals contributed a total of three trillion U.S. dollars to the U.S. economy through direct and ripple effects. Over the last decade, employment in hospitals has increased steadily. Today, approximately seven million people are employed at hospitals in the United States. All in all, hospitals in the United States generate a total revenue of over one trillion U.S. dollars. The Cleveland Clinic in Cleveland, Ohio, is one of the top hospitals based on gross revenue and net patient revenue. Other top grossing hospitals in the U.S. are, for example, the University of Pittsburgh Medical Center Presbyterian and the Cedars-Sinai Medical Center in Los Angeles. Among hospital operators, the Hospital Corporation of America from Nashville, Tennessee, is one of the largest. HCA operates 174 hospitals generating a total revenue of over 43 billion U.S. dollars. From the consumer's point of view, U.S. hospitals have a positive image. According to a Statista survey, 90 percent of Americans who had hospital treatment within the preceding five years were satisfied. Almost 50 percent were even very satisfied. 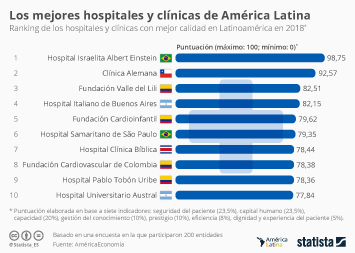 Furthermore, 70 percent of Americans think the quality of hospital care in the United States is better than in other developed countries.